You have added Magnolia Lace Strapless Dress in Cream into shopping cart. Girly and sweet describes this strapless lace dress! The Magnolia Lace Strapless Dress is fully lined. It has a tube neckline, empire waist and A-line cut. The dress is made of a delicate floral pattern lace. It has a banded waistline with an attached faux belt with a beautiful gold plated detail. An exposed back zipper completes this dress. This dress is perfect to wear to a rehearsal dinner or bridal shower. This dress is the perfect combination of girly and sweet. Pair with heels and gold jewelry. Details: Fully lined. Exposed back zipper. 70% cotton, 30% polyester. Lining: 100% polyester. Hand wash cold separately. Color will bleed. No bleach. Hang to dry. Small measurements: Length from top of bust to hemline: 28”. Bust: 32”. You have added Magnolia Lace Strapless Dress in Cream into Wishlist. You have added Magnolia Lace Strapless Dress in Cream for Stock Notification. 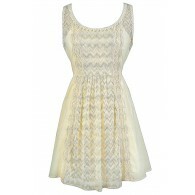 You have set Magnolia Lace Strapless Dress in Cream as a loved product. 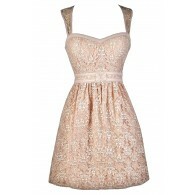 You have removed Magnolia Lace Strapless Dress in Cream as a loved product.